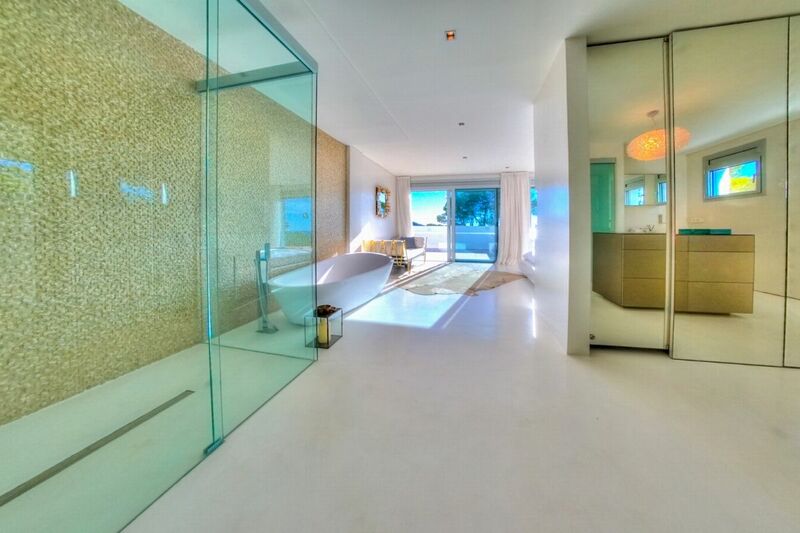 Onsite cleaner works 8 hours Daily Monday - Saturday. 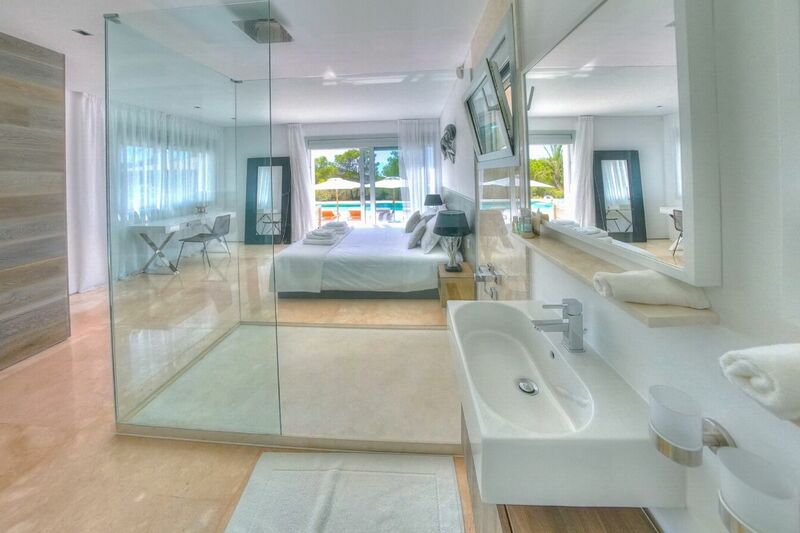 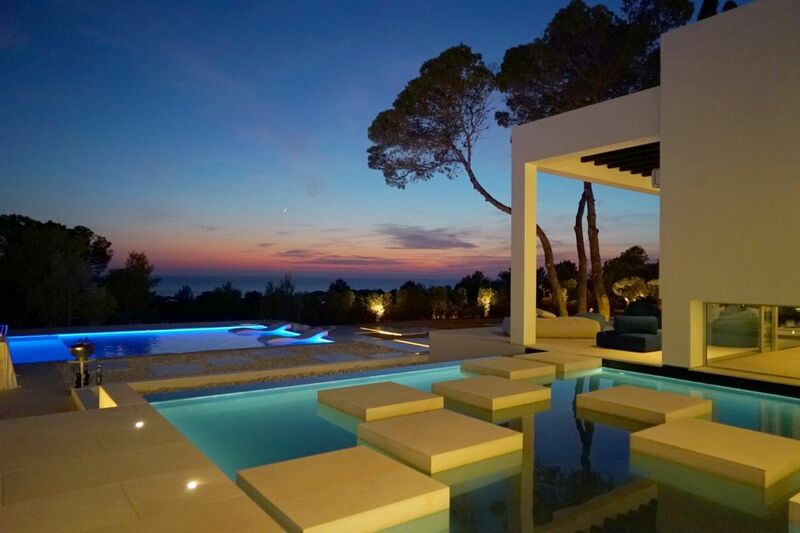 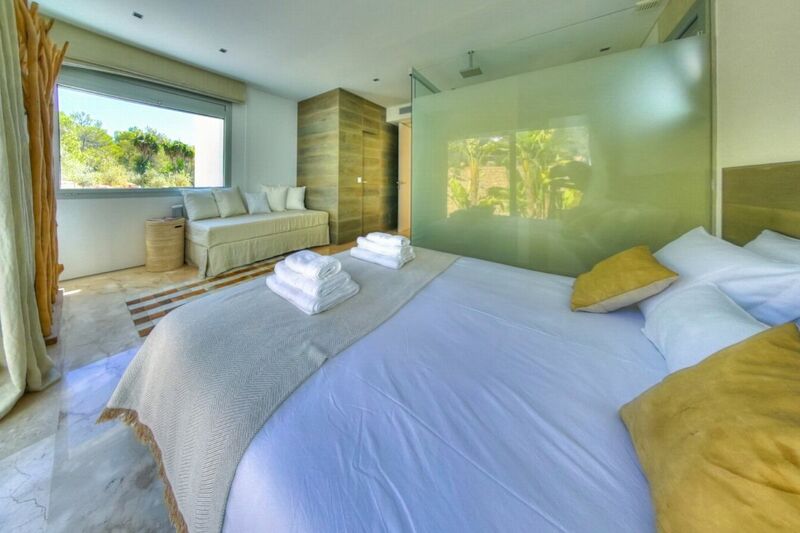 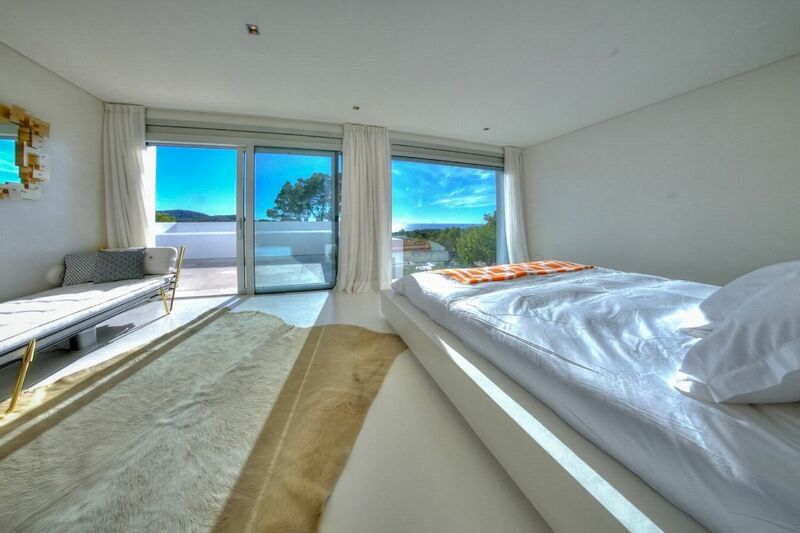 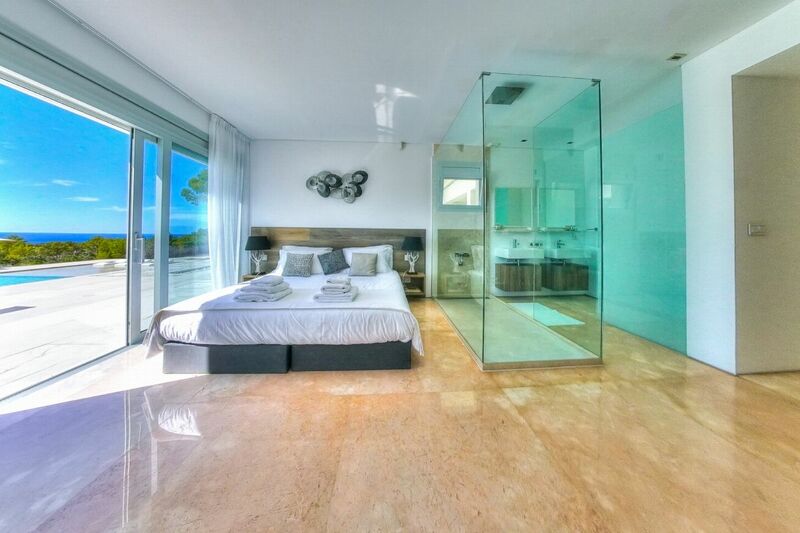 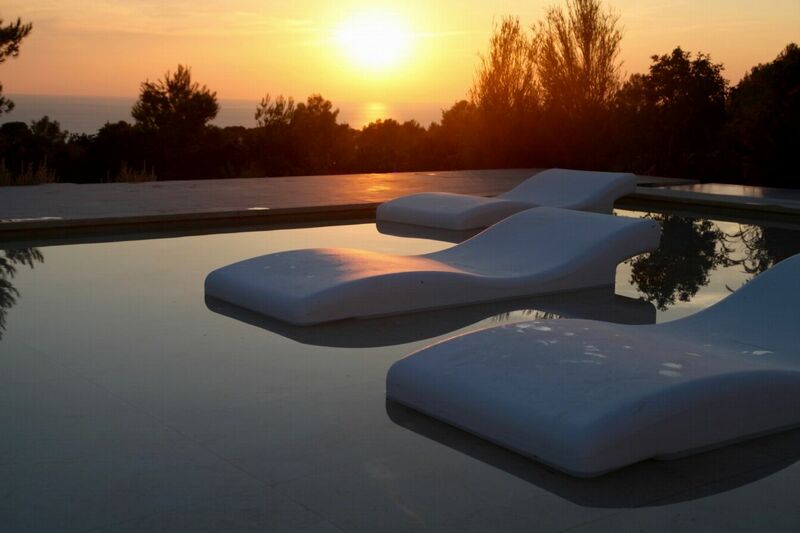 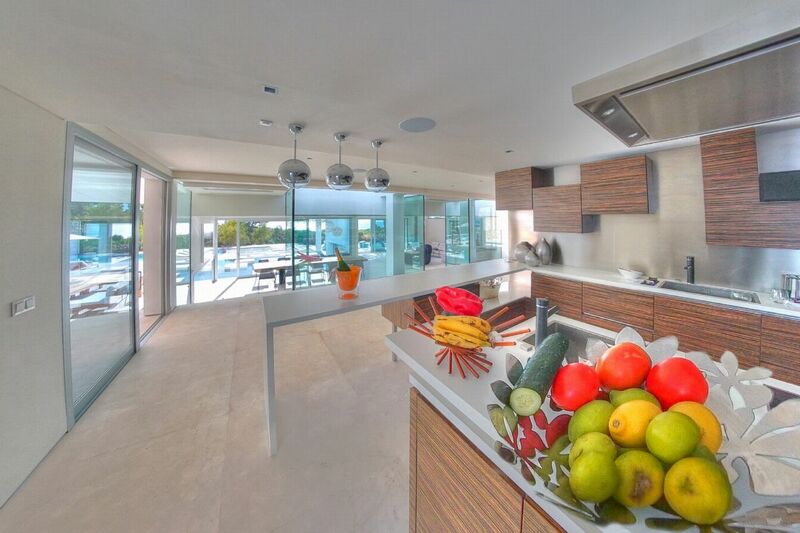 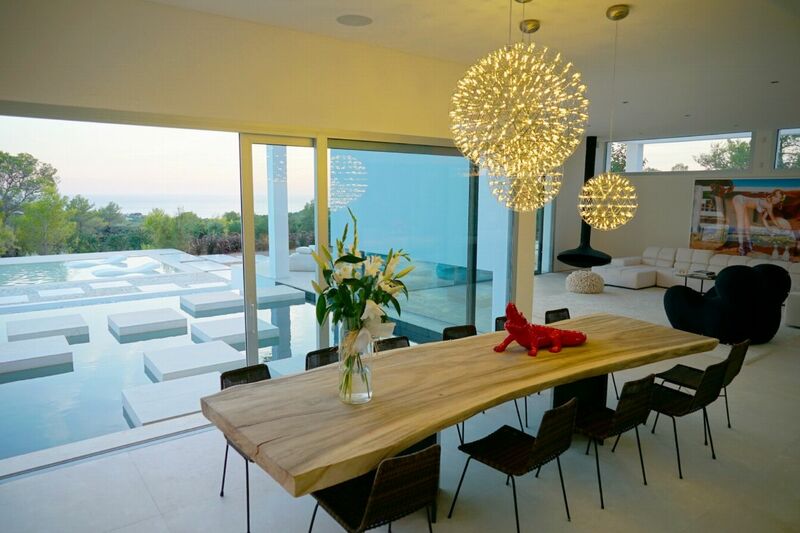 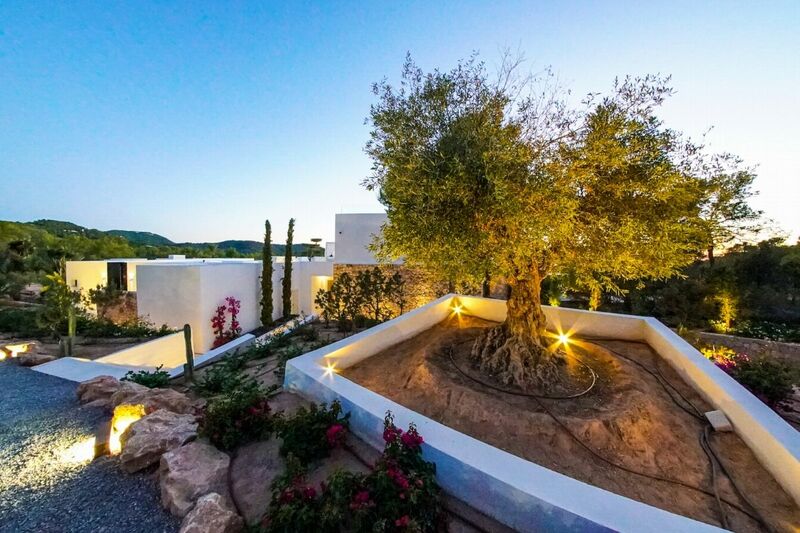 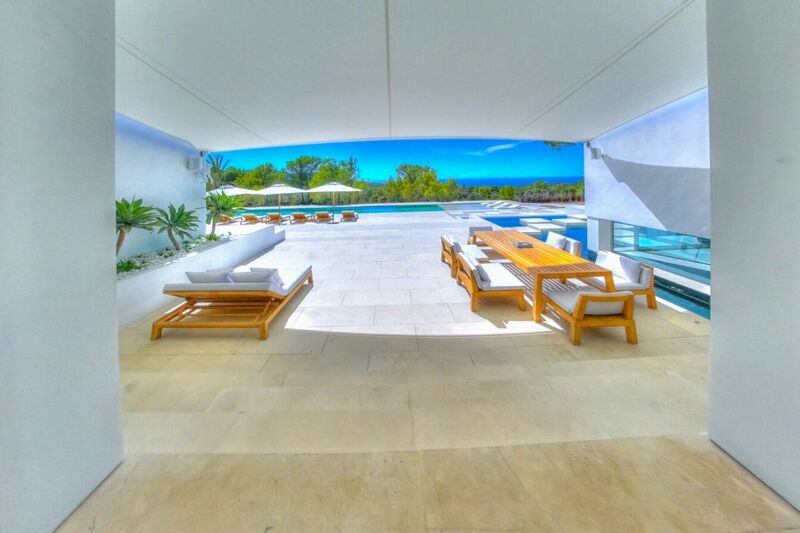 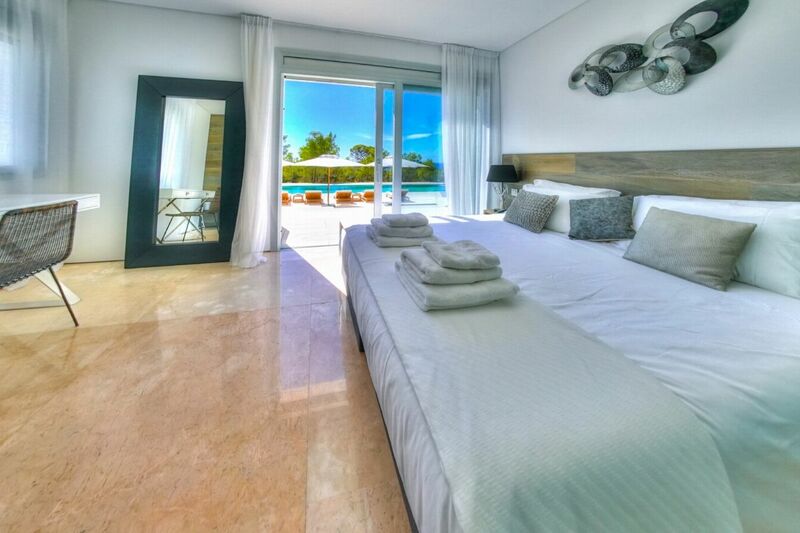 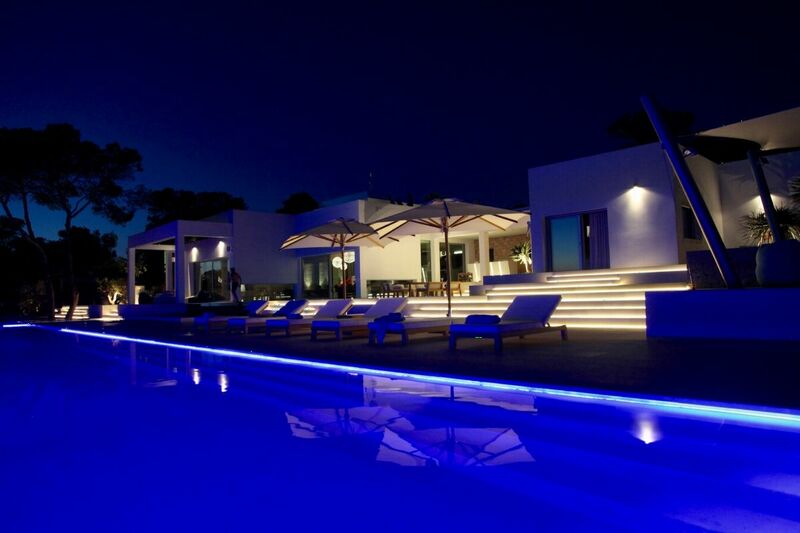 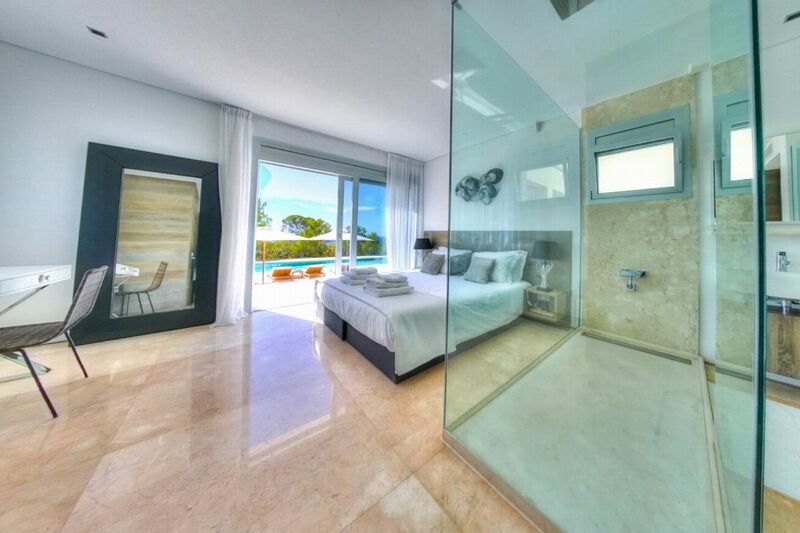 State of the art luxury villa with extensive gardens and seaviews. 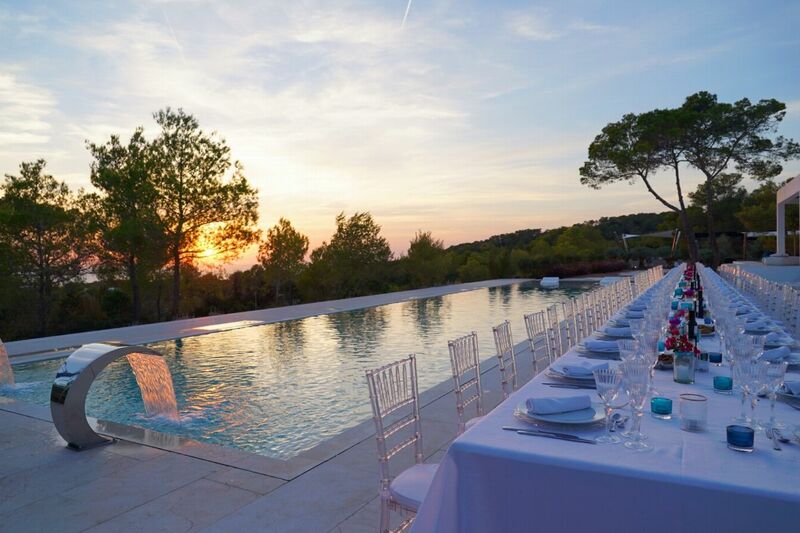 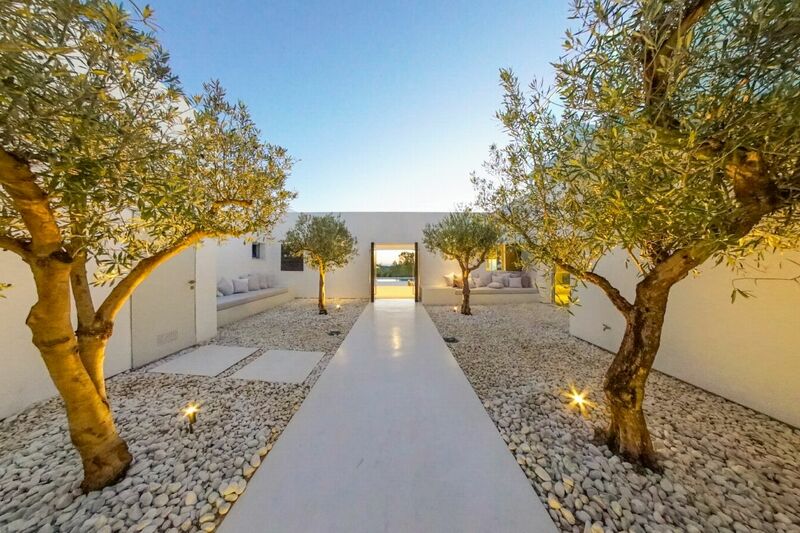 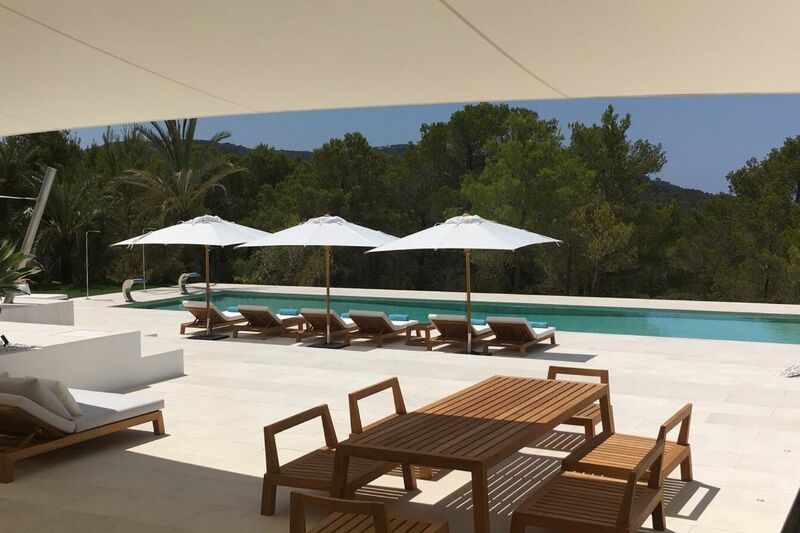 This villa is set on over 16,000 sqm of private land with 550 sqm of internal space and extensive external terraces, dining and entertaining areas covered by white alabaster marble, micro cement, bespoke timber and manicured lawns & landscaping. 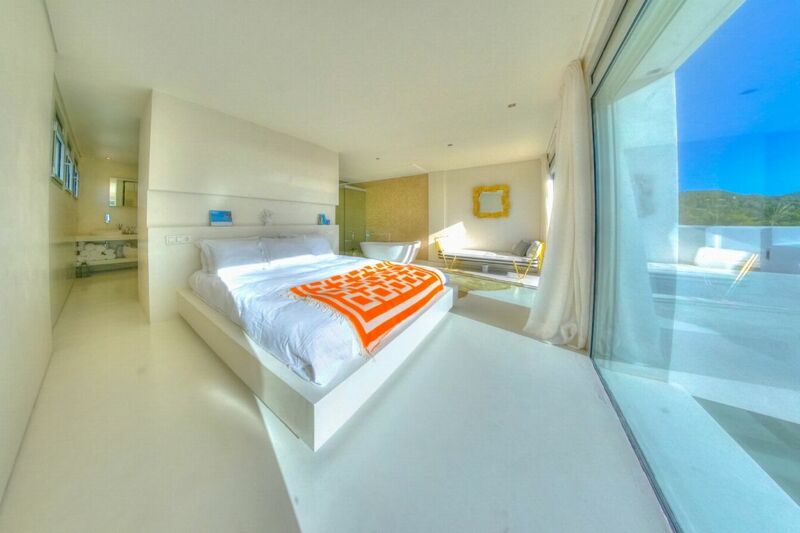 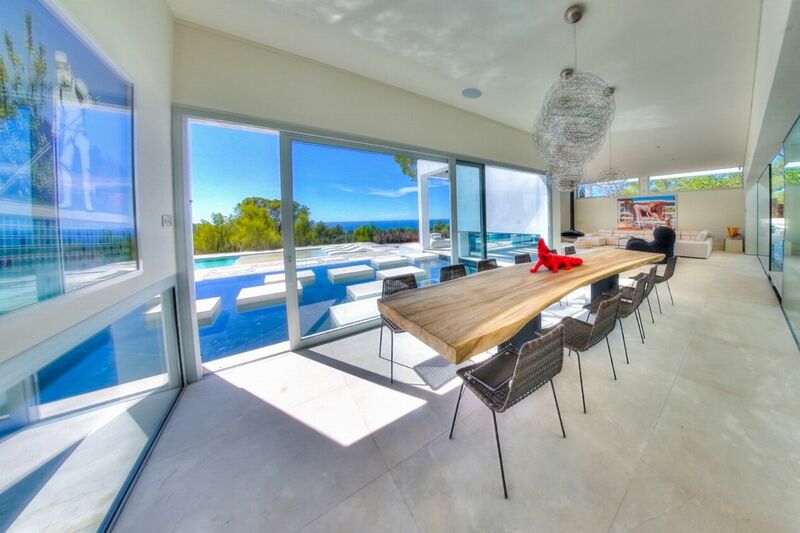 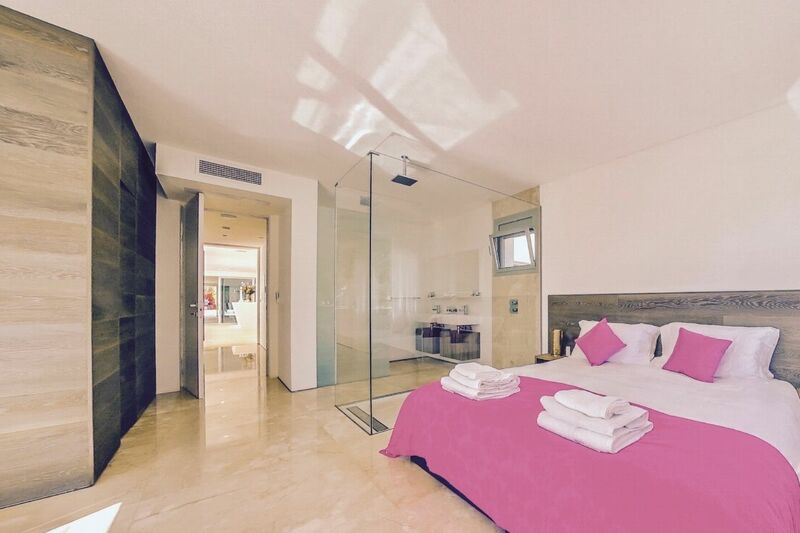 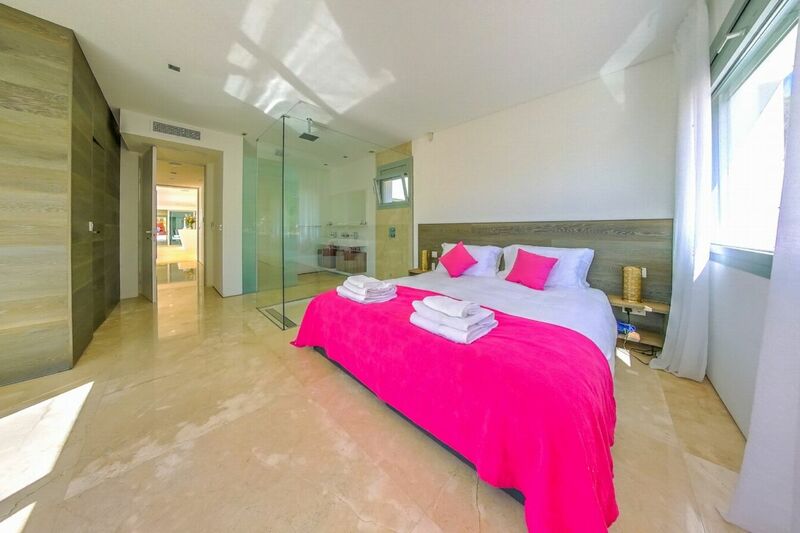 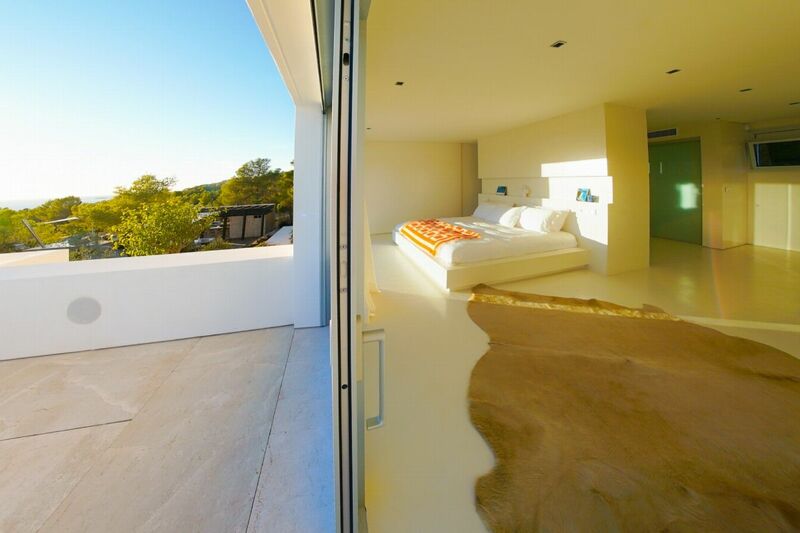 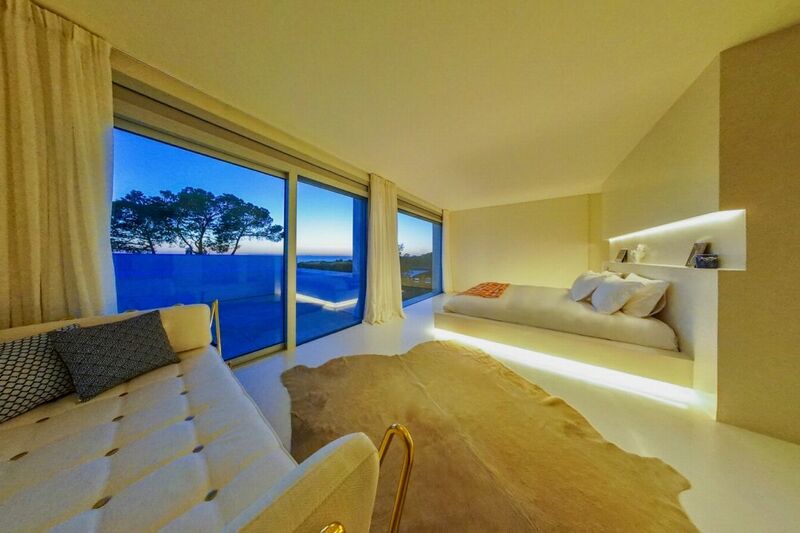 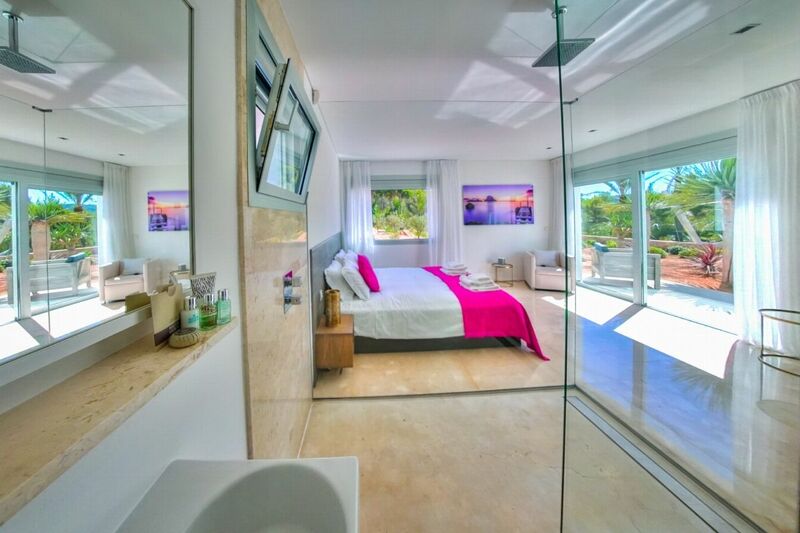 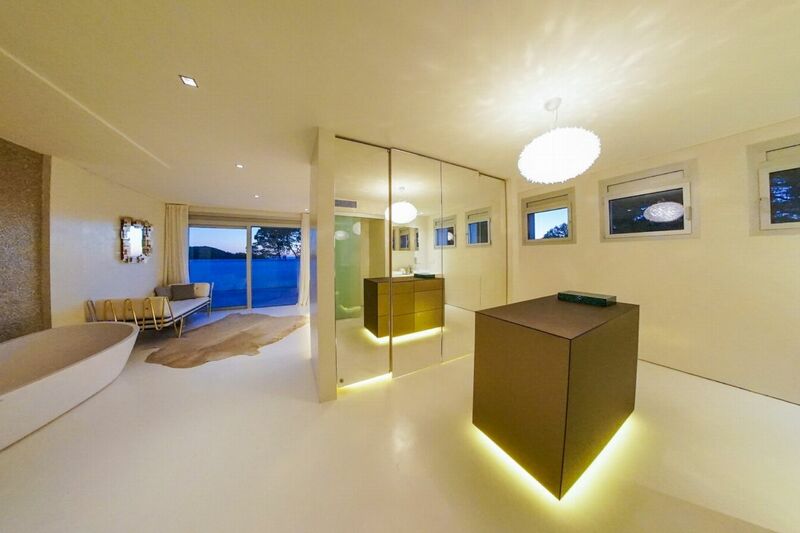 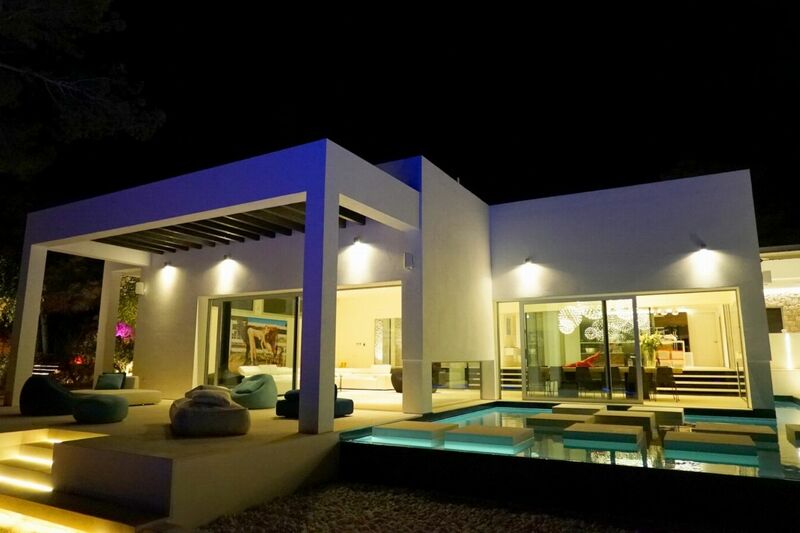 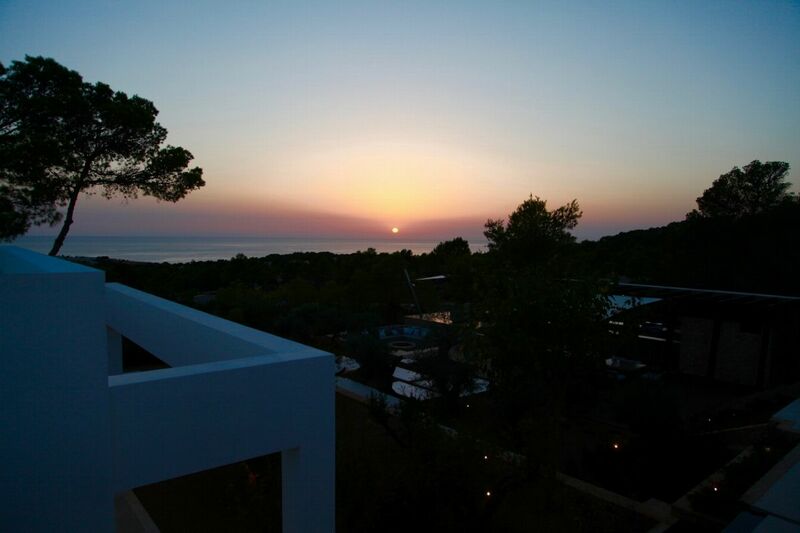 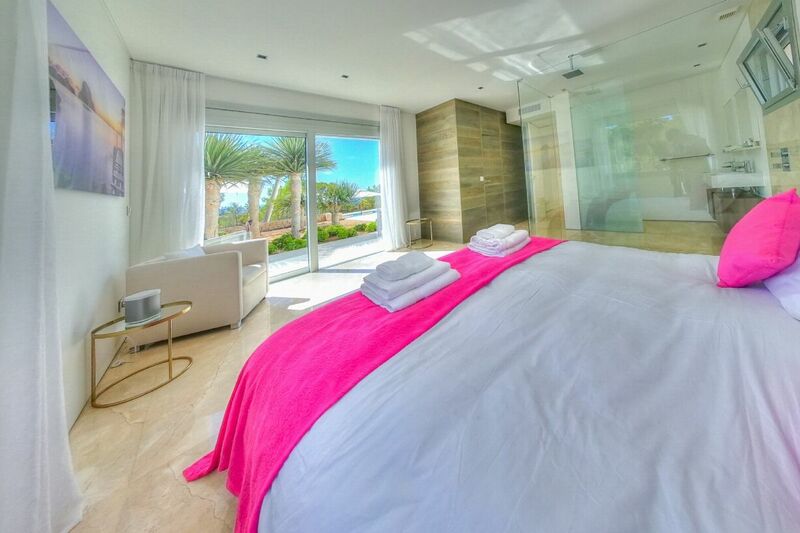 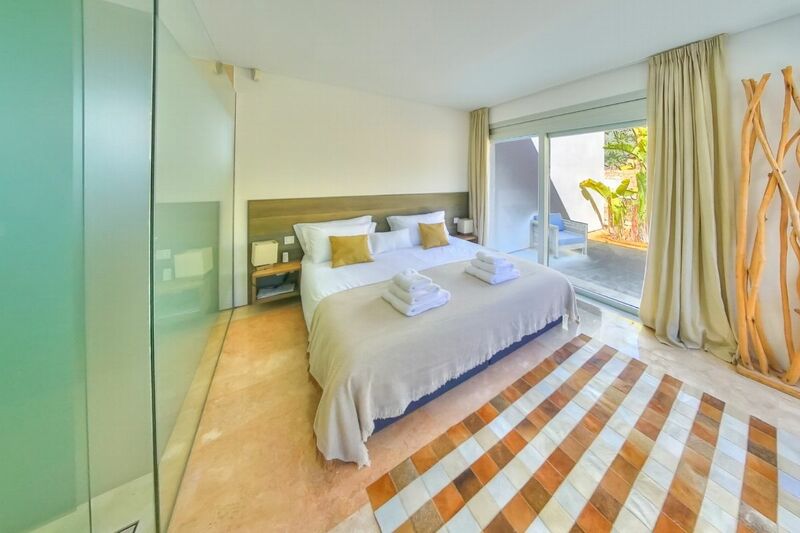 This is a beautiful, modern, secure and architecturally designed sunset villa with panoramic sunset water views of Cala Tarida. 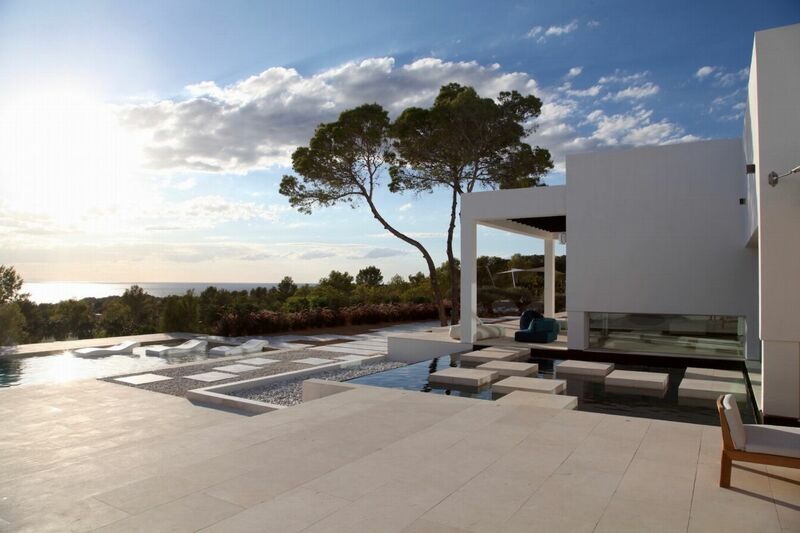 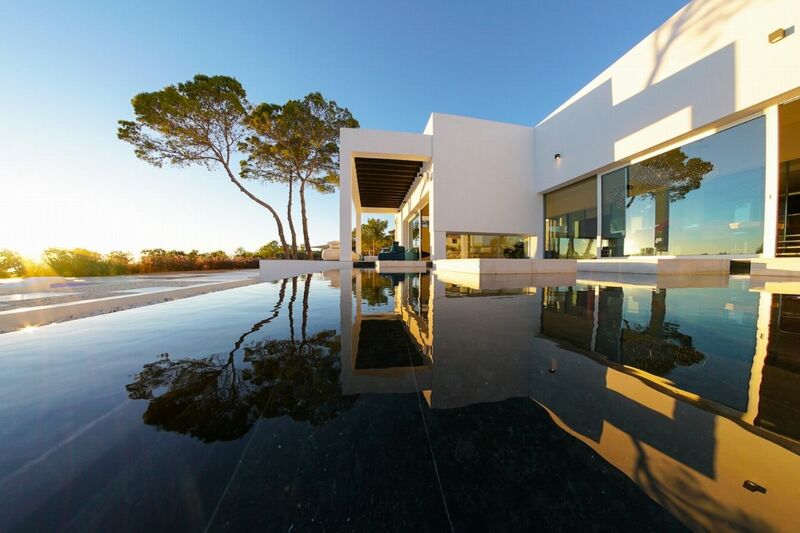 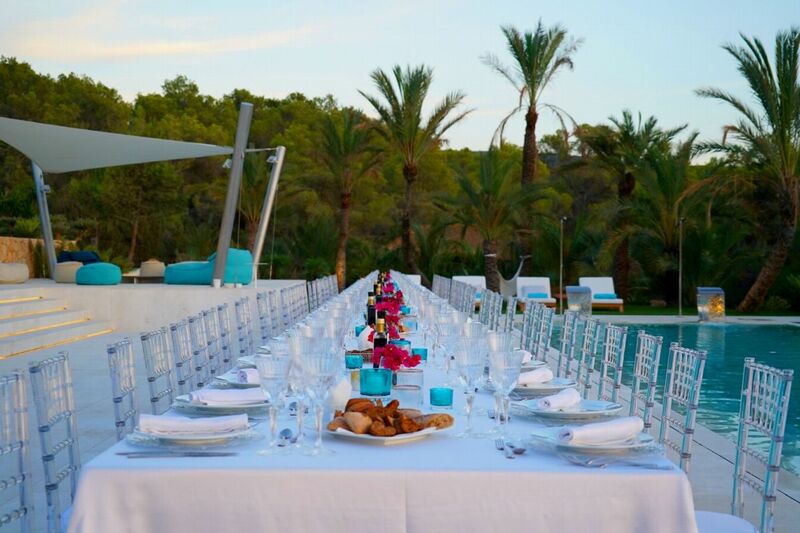 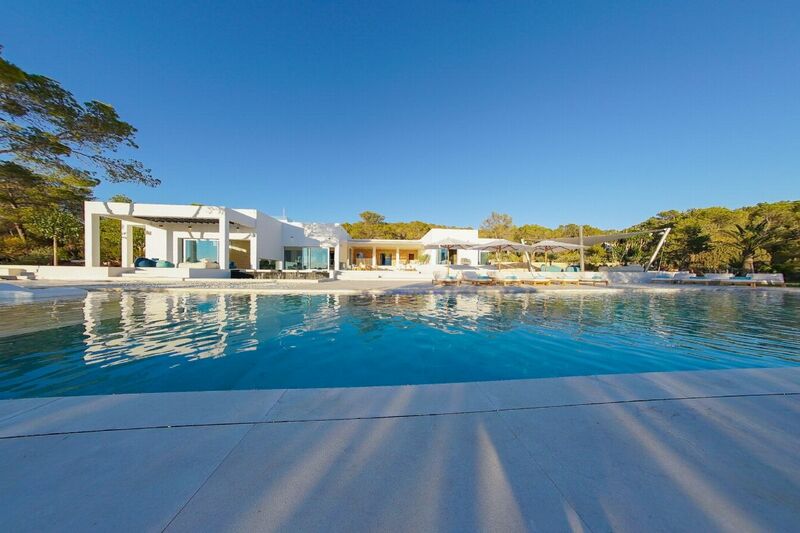 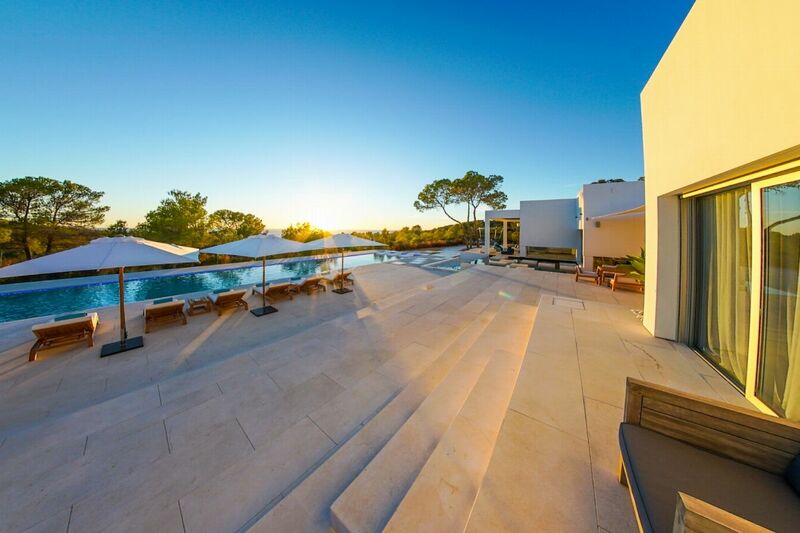 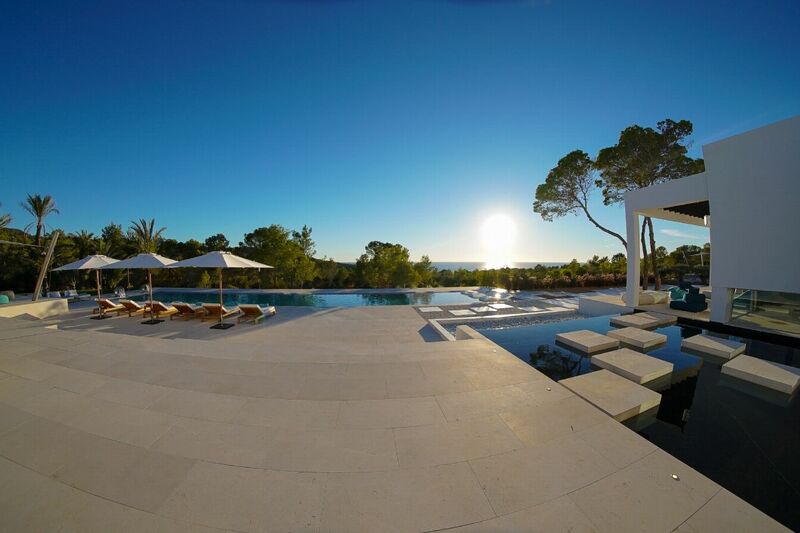 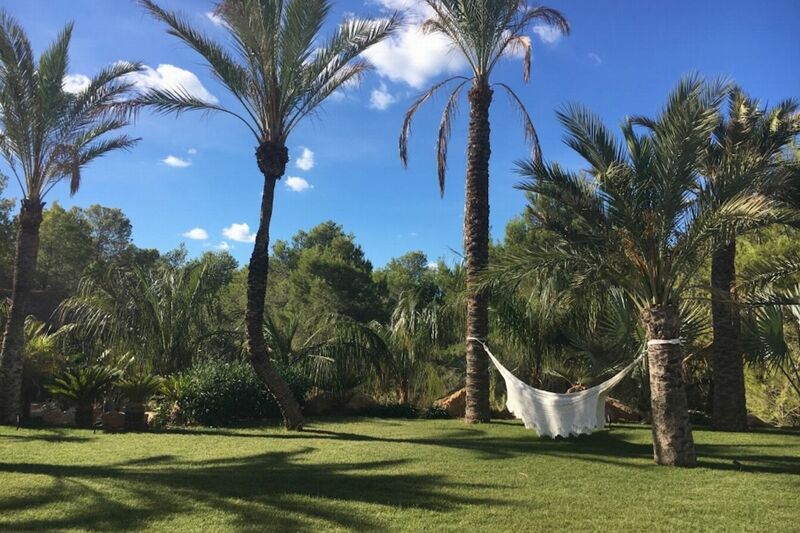 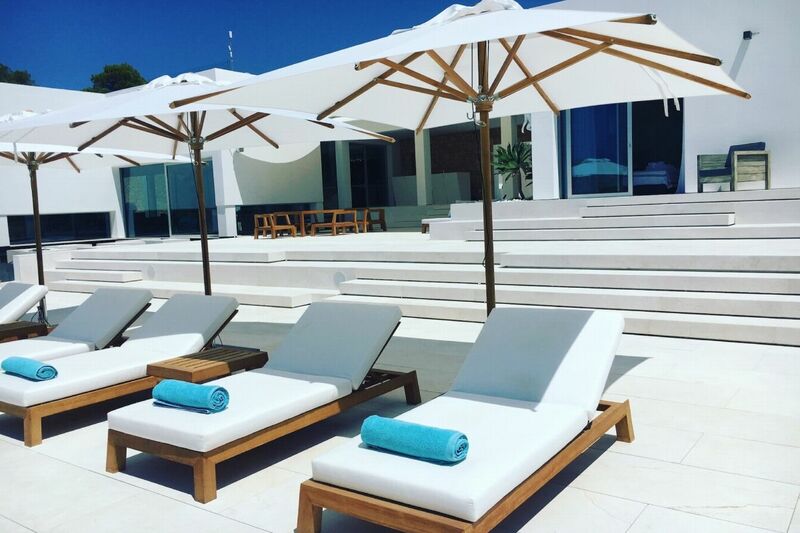 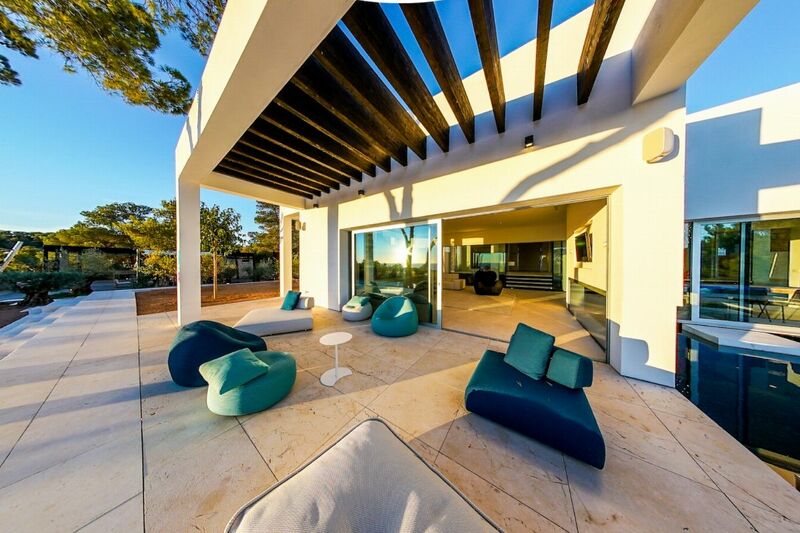 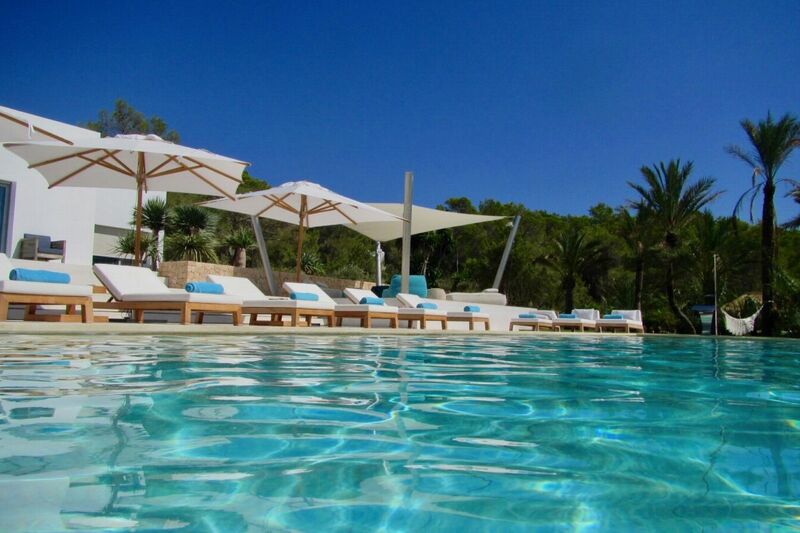 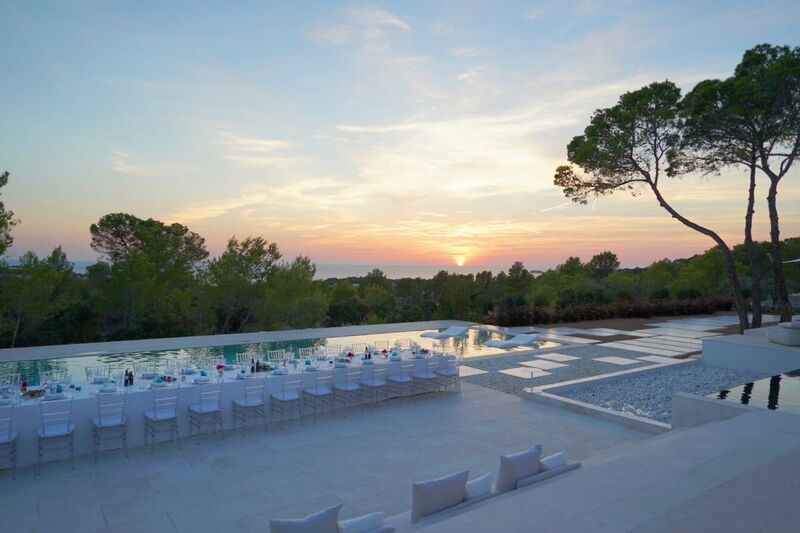 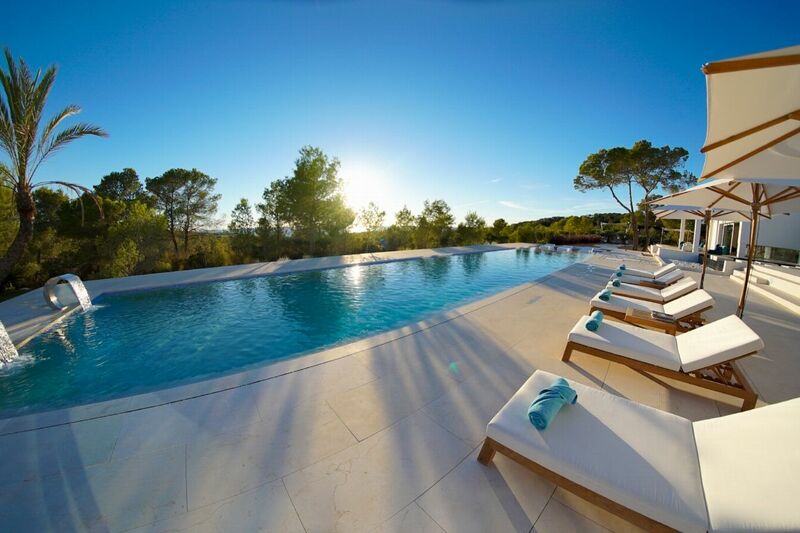 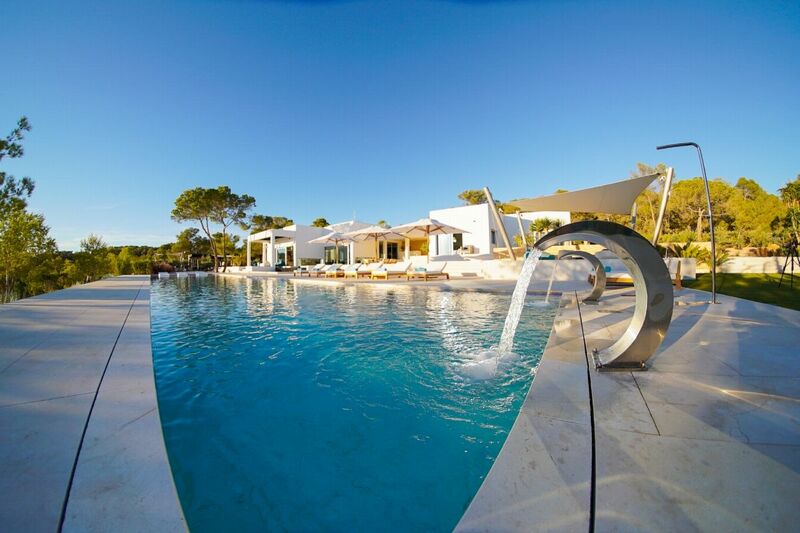 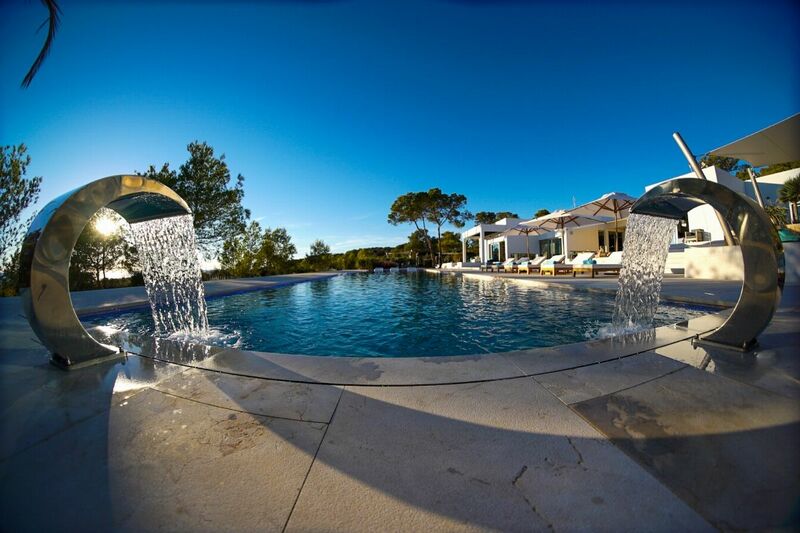 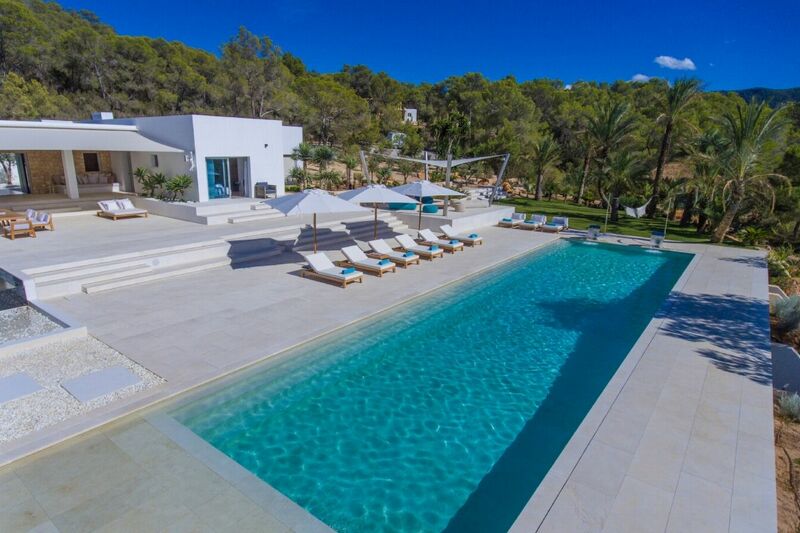 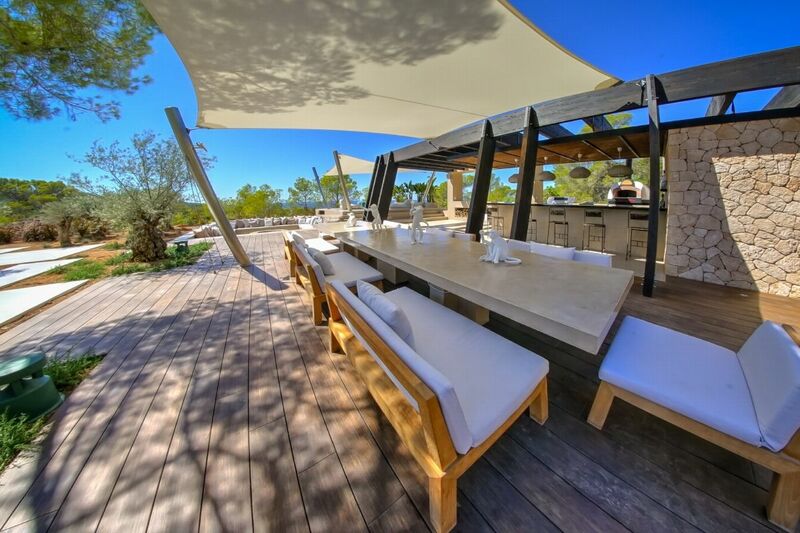 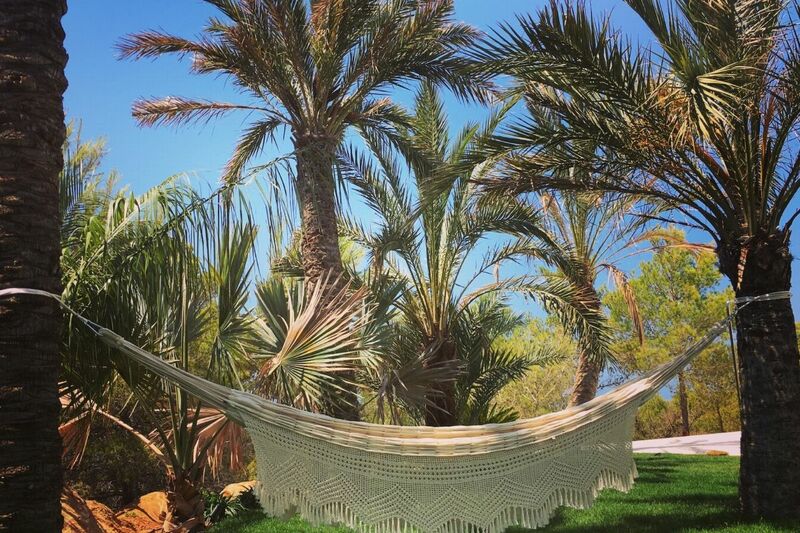 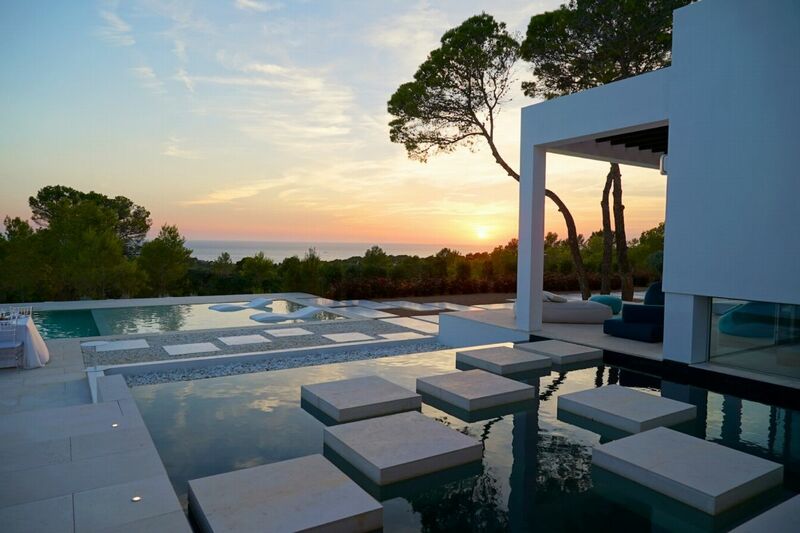 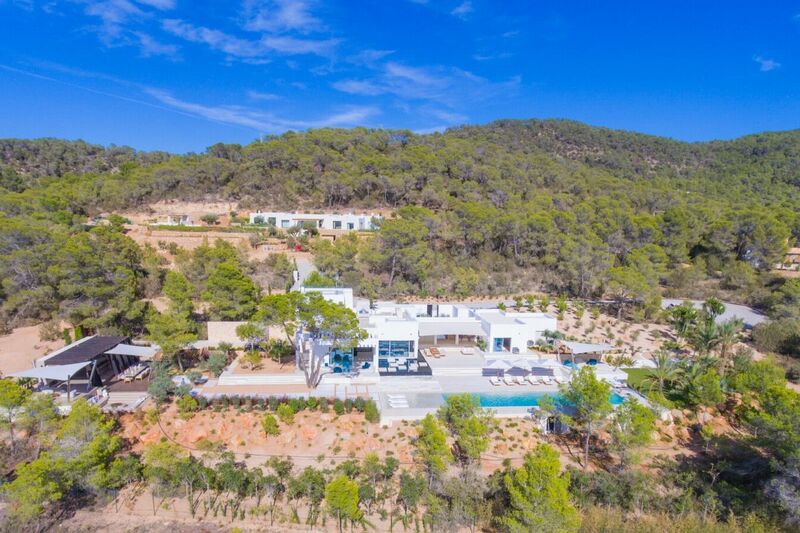 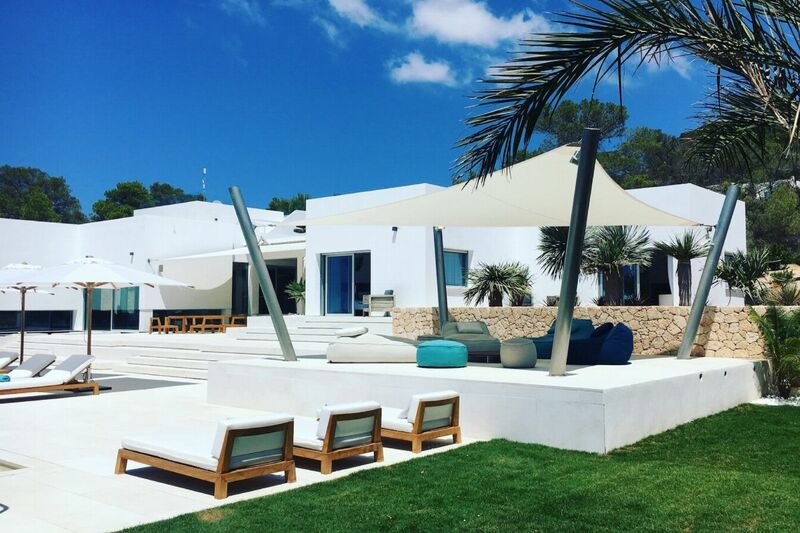 Cala Tarida Cristal is set on over 16,000 sqm of private land with 550 sqm of internal space and extensive external terraces, dining and entertaining areas covered by white alabaster marble, micro cement, bespoke timber and manicured lawns & landscaping. 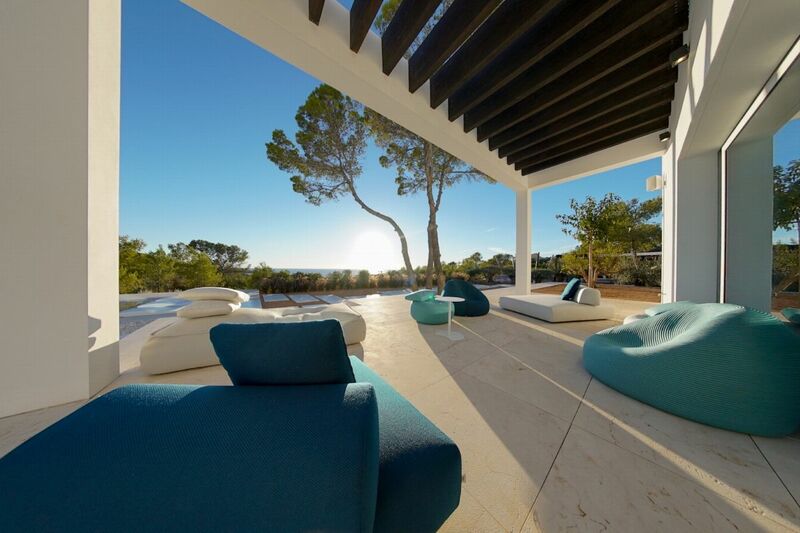 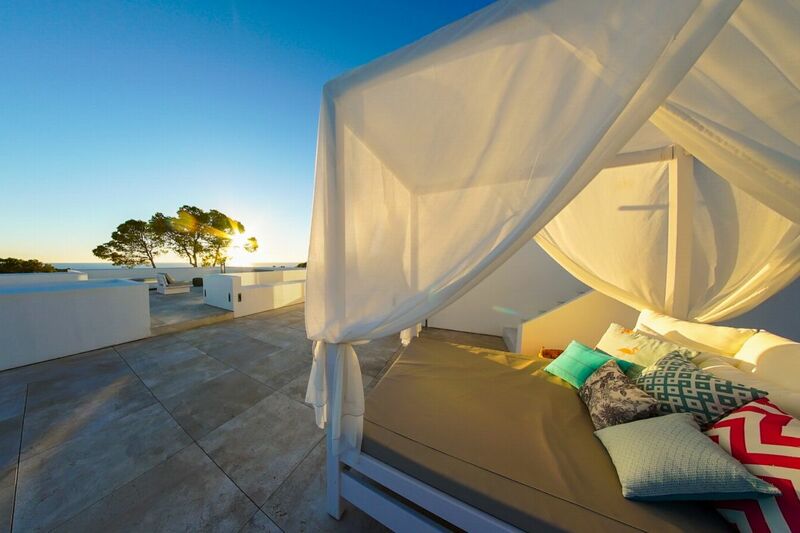 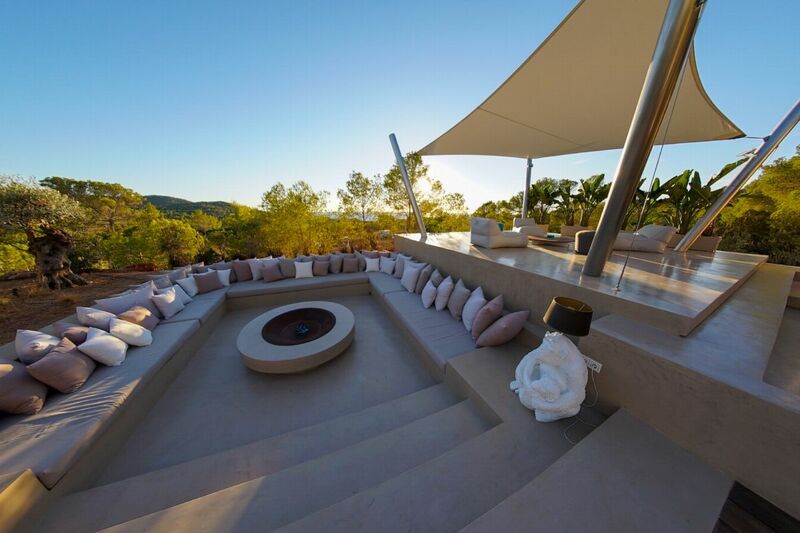 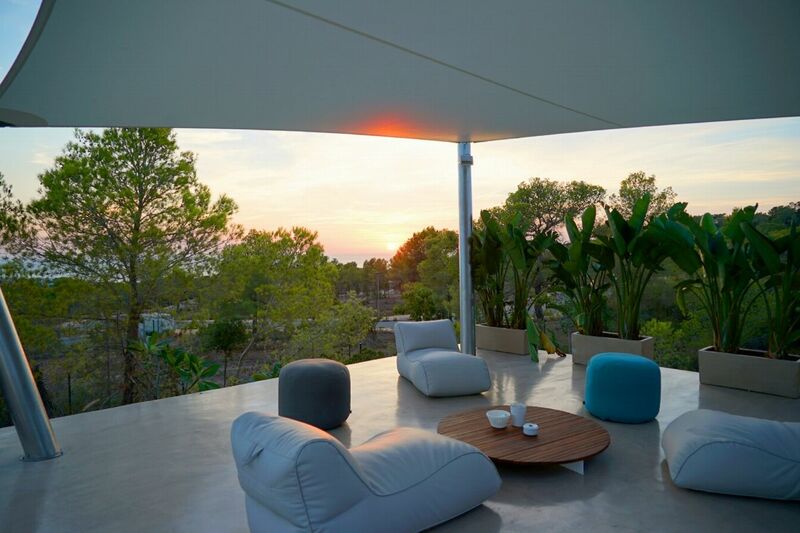 This property offers 8 separate chill-out areas with seating and sound systems, with different areas offering sun and shade throughout the day. 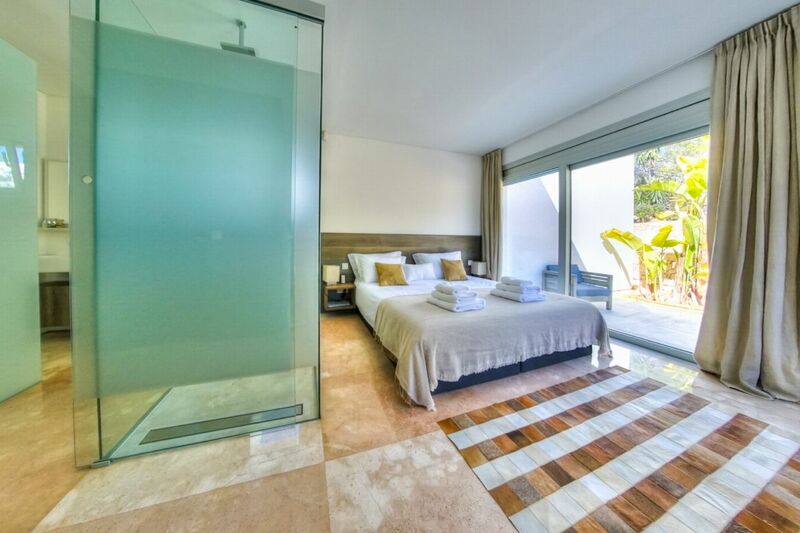 It has an integrated alarm system with direct connection to 24 hr monitoring, CCTV cameras outside the property, the property is fully fenced around the perimeter and has a security gate. 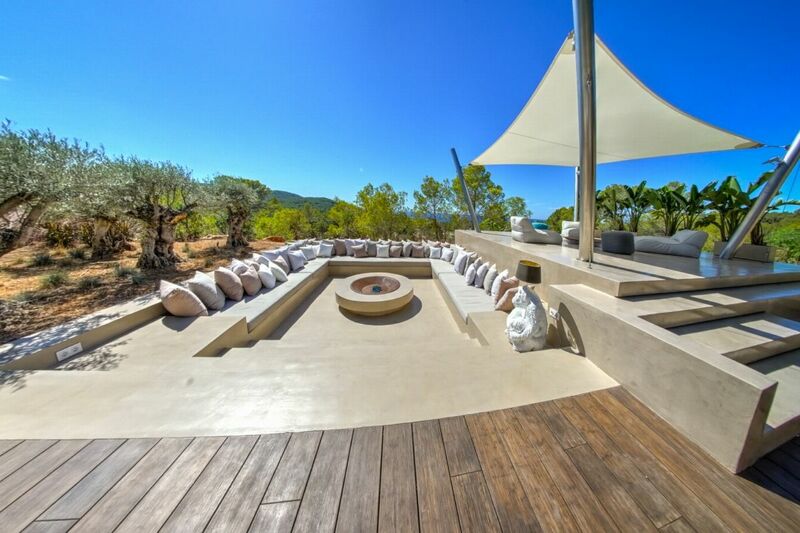 OUTDOOR AREAS There are amazing outdoor facilities including: â€¢ a heated Jacuzzi and outdoor shower on the roof terrace â€¢ a huge 25 m swimming pool, dual spa water fountains and two more outdoor showers next to the pool â€¢ the pool area boasts 12 designer sunbeds, 1 large day bed and three in-water sun-beds â€¢ a sunken firepit with bespoke cushioned seating (fire use subject to Ibiza fire laws) â€¢ extensive landscaped gardens with water features, including manicured grass, palm trees, olive grove and citrus grove â€¢ separate on-site parking provision for 10 cars â€¢ Bali Hut - two person Bali hut and massage centre The extensive integrated outdoor lighting system is controlled by your mobile phone â€“ 8 different outdoor settings enabling the guests to create different moods. 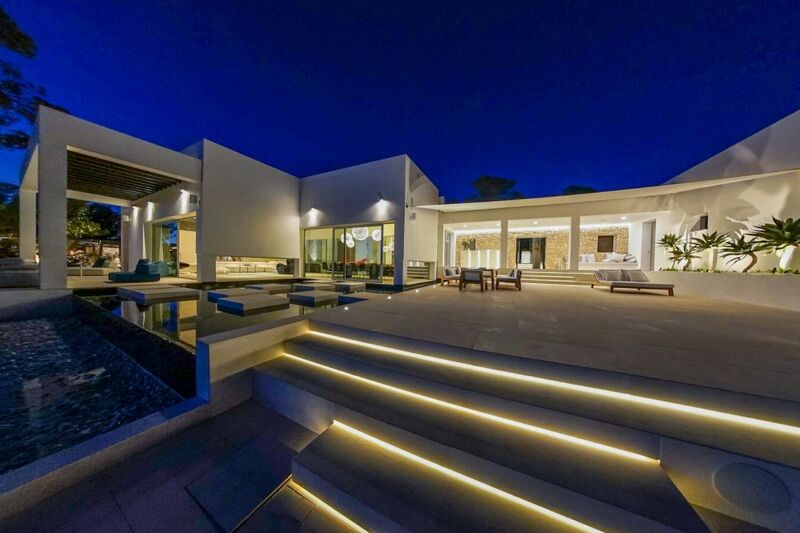 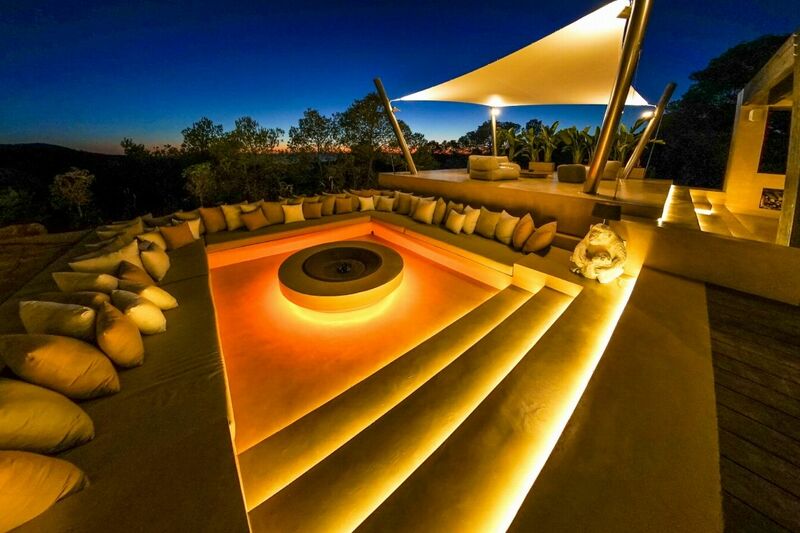 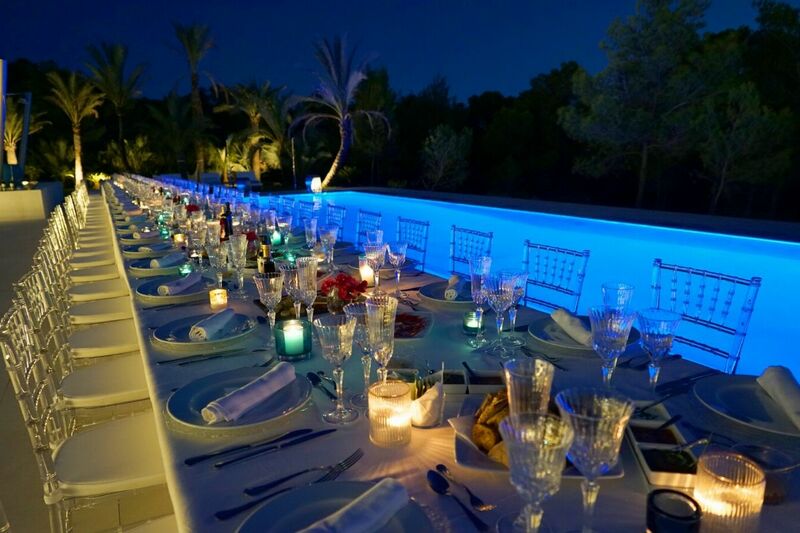 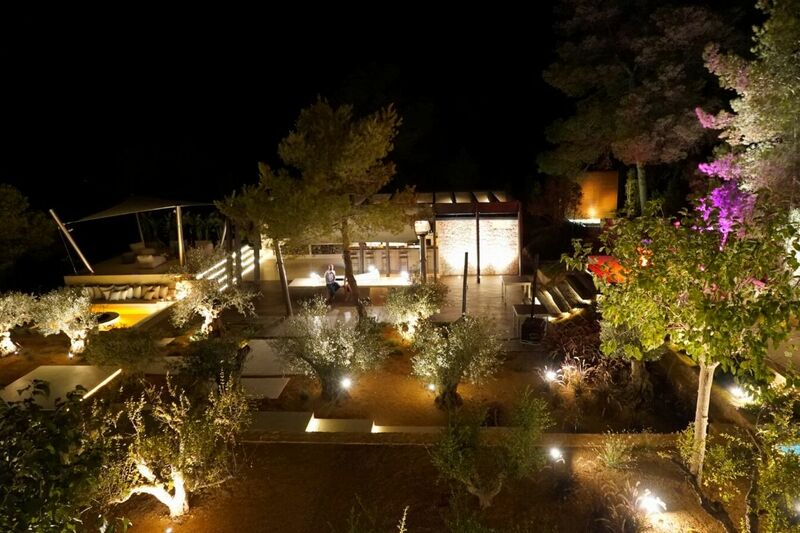 There is significant outdoor lighting across all external areas including LEDs in the swimming pool, the water feature that runs through the house and along all of the outdoor steps. 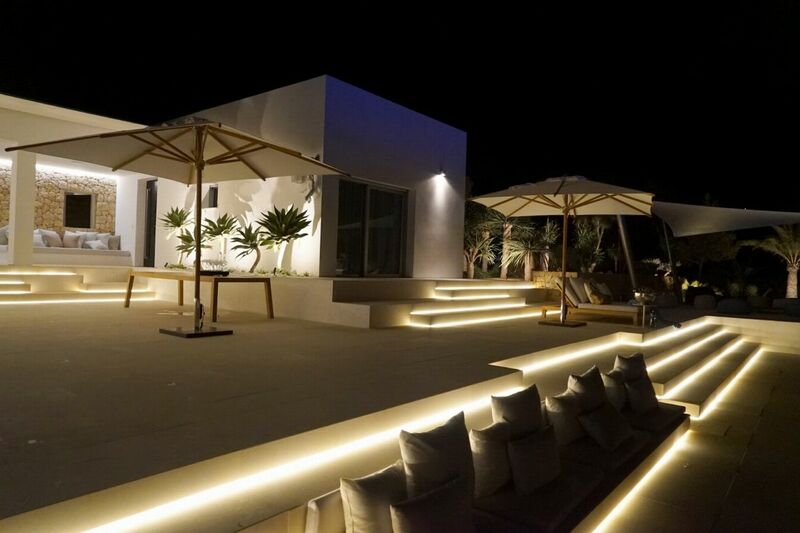 The 3 bespoke micro cement bars are located in the following areas: Ground floor terrace â€“ equipped with osmosis ice machine and refrigerator; BBQ area â€“ equipped with osmosis ice machine, dishwasher and refrigerator; Roof terrace. 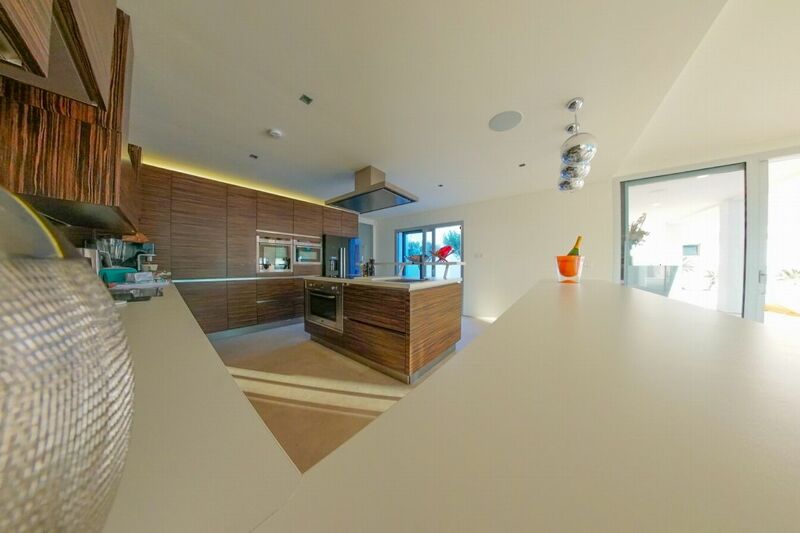 LIVING AREAS The indoor facilities are equally amazing including: â€¢ a free standing â€˜floatingâ€™ gyrofocus fireplace in the main living room, along with a 75 inch Samsung SMART TV powered by a 5.1 Bose System, Apple TV, Netflix and Satellite â€¢ brand new furniture and modern art from leading designers and artists across the world including Tony Kelly, Richard Orlinski, Blek le Rat, Paolo Lenti, Tom Dixon and Moooi The villa provides three separate kitchen areas: â€¢ Main house kitchen equipped with under counter oven, regular oven, microwave oven, fridge/freezer, five ring electric hob â€¢ Additional separate staff kitchen equipped with wine fridge, fridge/freezer, hob â€¢ BBQ area equipped with five burner gas BBQ, gas wok hob, professional pizza oven, refrigerator, osmosis ice machine Three separate and distinct dining areas: â€¢ Internal Dining - main house dining table seating 12 people â€“ overlooking the water fountains, water feature, swimming pool and sea view of Cala Tarida â€¢ Main Terrace Dining - outside on the main terrace dining for 10 people â€“ close to the main in-house kitchen and ground floor terrace bar â€¢ Olive Grove Dining - outside in the BBQ & olive dining area for 20 people â€“ close to the BBQ kitchen equipped with five burner gas BBQ, this area also includes two 3 metre Corten steel fountains, separate raised chill-out area, an indoor shower, toilet and duel basin washroom. 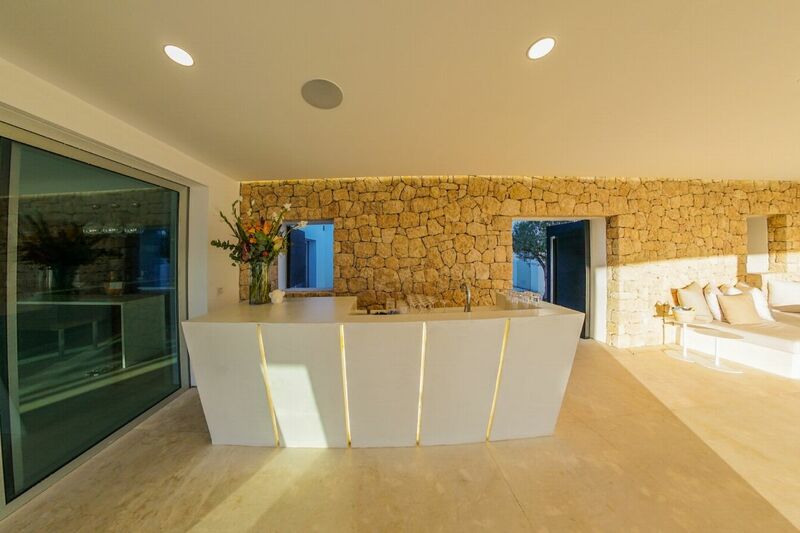 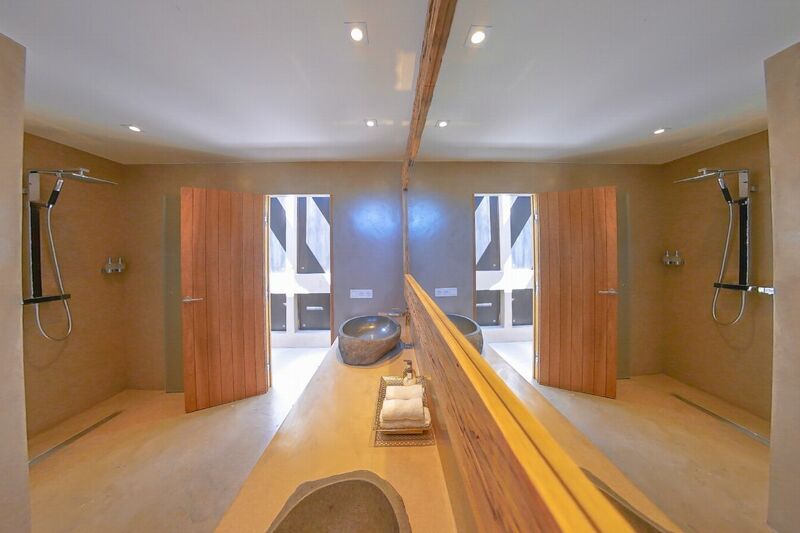 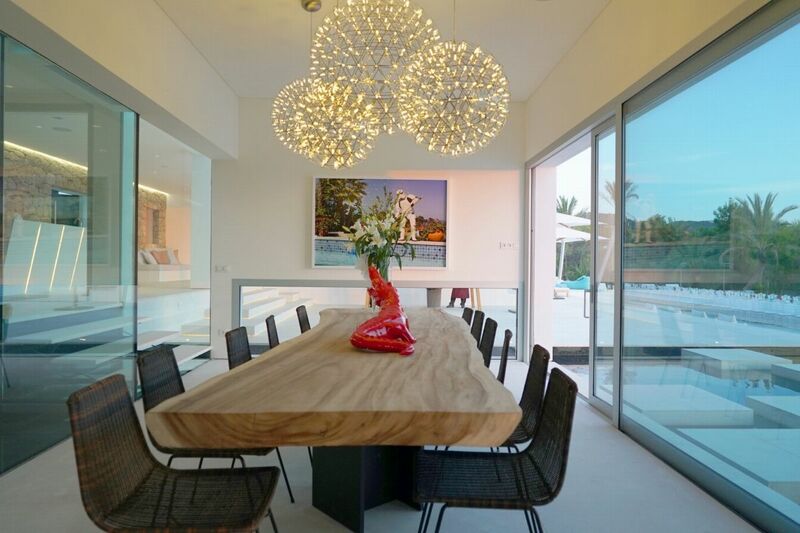 This house has a fully integrated sound system throughout and in all outside areas all controlled by Sonos â€“ up to three different sources of music can be played at one time and the property carries 10+ separable zones. 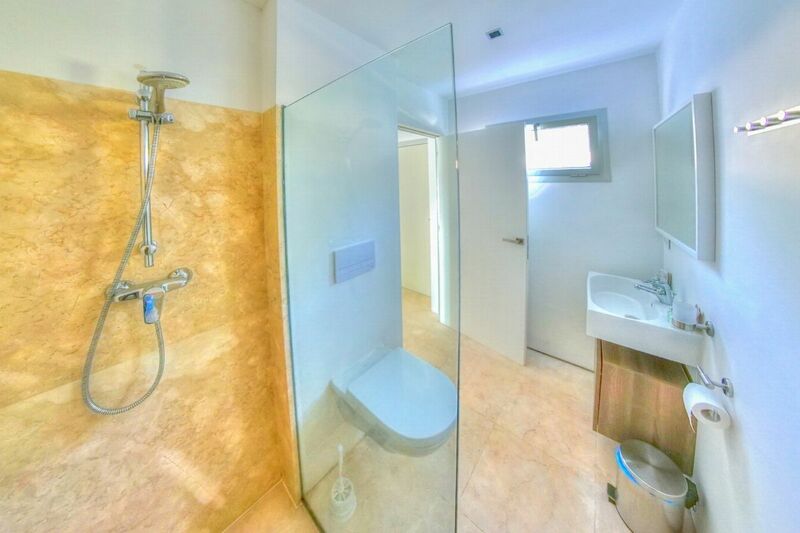 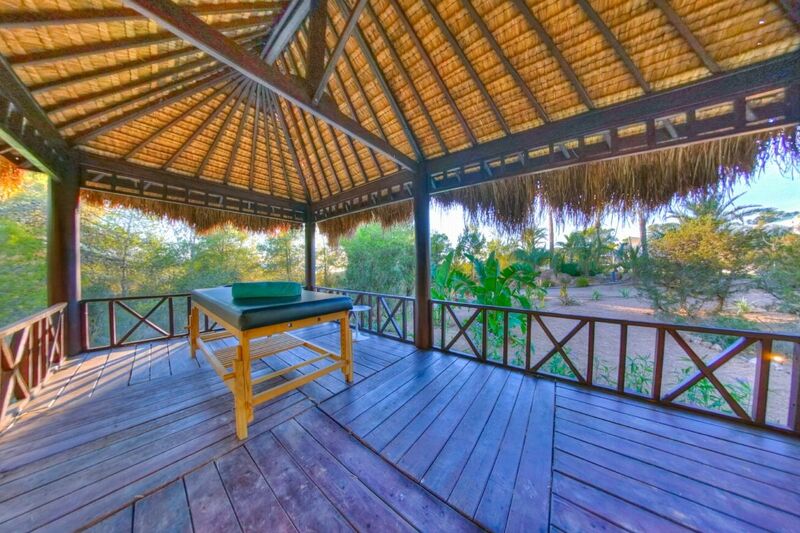 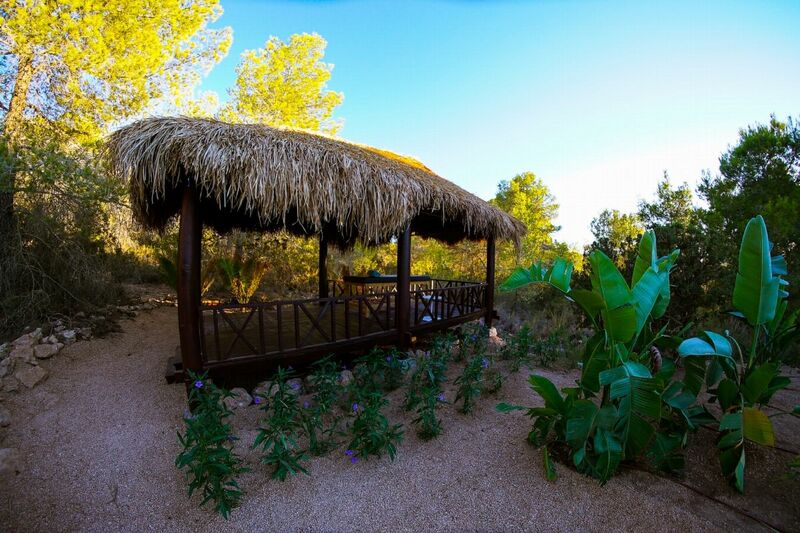 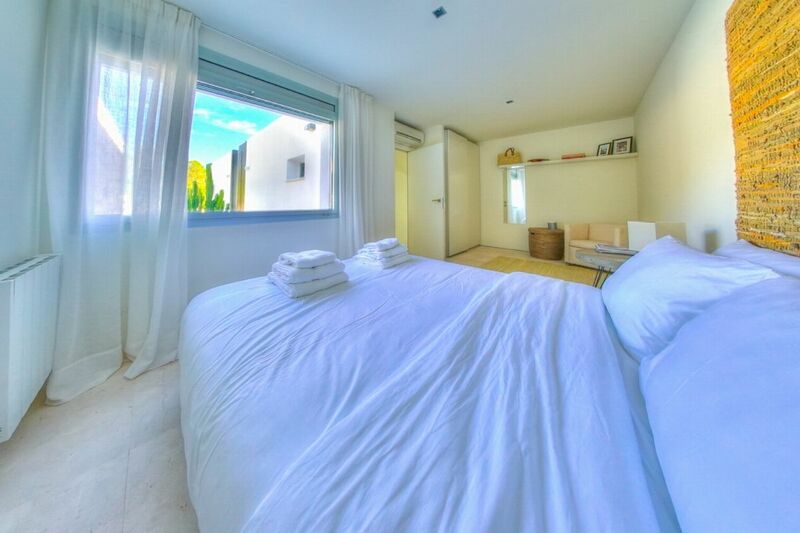 The property is fully air conditioned and has full access to high speed internet. 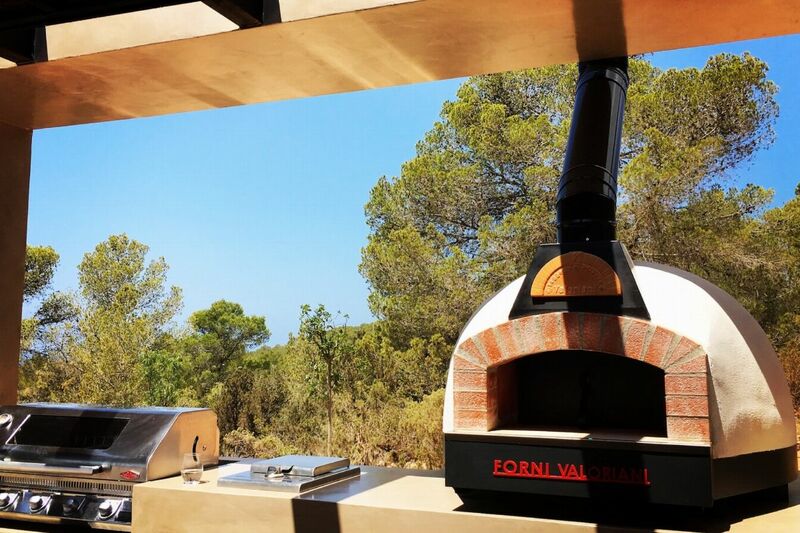 Fully equipped BBQ kitchen with 5 gas burners. 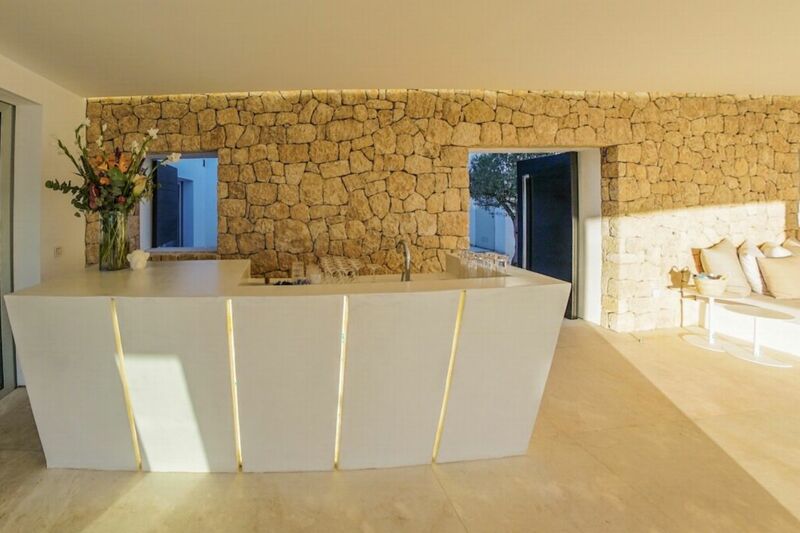 Situated in the Olive Grove dining area.